It is based on the 1997 North Hollywood shootout, possibly the most notorious bank robbery in American history not perpetrated by John Dillinger or John Wojtowicz, the Dog Day Afternoon dude. Or so we are told. In addition to changing the names of the guilty and innocent alike, this heist movie almost completely alters the surrounding circumstances. Of course, it hardly matters, because this is a Nic Cage movie. In between flying bullets, viewers can enjoy a lecture on bullying in York Alec Shackleton’s 211 (trailer here), which opens this Friday in Los Angles. Over in Iraq, a group of mercs are about to whack a scumbag development executive, who plundered reconstruction funds and then stiffed the hired help. They arrive seconds too late, because his finance guru is able to disperse all the funds into anonymous small dollar accounts, tucked away in modest, unassuming provincial banks. Feeling rather put-out, they induce their former employer to name one of the banks before capping him. They then set off from the war zone to Somewhere, Pennsyltucky to rob it blind. Of course, this plan makes no sense. The bank was not party to any of these nefarious deeds and according to the film’s own set-up, there is only a fraction of the take squirreled away there. It is like the entire film is based around a rash temper tantrum. Mike Chandler, ominously due to retire, just so happens to be cruising around the 1st National Bank of Squaresville, with his partner and son-in-law, Steve MacAvoy. Poor Chandler is on the outs with his daughter, because he did not properly emote during his late wife’s demise. For extra added manipulativeness, Chandler has a ride-along, Kenny the pre-teen, who was nearly expelled for decking his bully. Things are about to get bloody when the bank robber detonate a bomb at a diner to distract the cops, but Chandler is too intuitive for that kind of ploy. Unfortunately, he is still drastically out-gunned. Shackleton’s screenplay simply makes no sense whatsoever. Even more problematically, the villains are about as bland and colorless as they can possibly be, without completely evaporating into the atmosphere. These two considerable drawbacks are actually quite a shame, because Shackleton’s execution as a director isn’t bad at all. There are some pretty tense shootouts in this film, but the extraneous stuff surrounding them is all very ridiculous. It definitely feels strange to describe Cage as a stabilizing presence, but that is about the size of this film. It is also fun to watch Albanian pop star Bleona make deductive leaps out of nothing as Christine, the Interpol agent. Granted, Interpol does not function that way. It is more of a clearing house for information, but whatever. The rest of the cast is either immediately forgettable or gratingly annoying. Although it was probably always destined to be a B-movie, 211 still should have been better than it is. Shackleton’s pacing is tight, but his plotting and characterization are weak. This is the sort of film that proves the advantages of the division of labor. 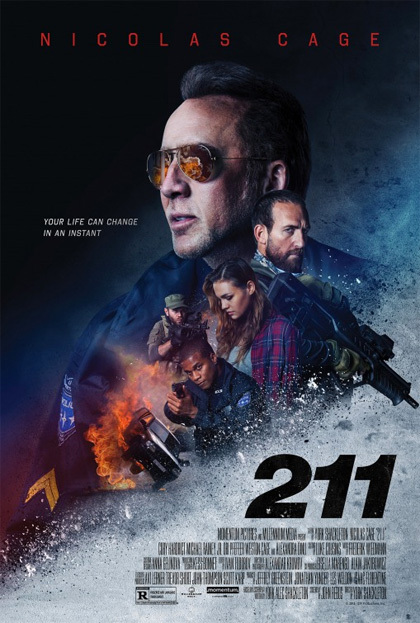 Only for diehard fans of Nic Cage and explosive mayhem, 211 opens this Friday (6/8) in Los Angeles, at the Arena Cinelounge and also releases day-and-date on iTunes.